Eid-al-Adha is almost here, diving all of us into the mood of celebration and revelry. The festival commemorates the spirit of sacrifice which should accompany our faith in the almighty. The day brings along happiness as we all spend our holidays relaxing at homes and celebrating Eid. But what makes the day more special is the spicy delights we indulge in during this festival. 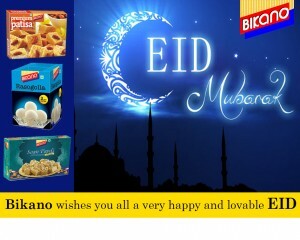 Bikano is coming up with a special range of sweet and salty delights this Eid-al-Adha. In our country, Eid is a festival which reminisces us of our unity with other religions. India is a land of all castes and communities and Eid becomes a messenger of this amity in diversification. This festival ought to be special and we make it so at Bikano. Eid-al-Adha is called the ‘Salty Eid’ as what we savor on this holy day is spicy delights made of rice. Bikano serves an authentic range of namkeen and bhujia which are meant to make your day special. Bikano is a firm believer of unity in all religions and hence it celebrates all festivals with an incomparable vigor and vitality. Come and be a part of this unity as peoples from all religions relish the salty delights of Eid-al-adha by savoring the lip-smacking Namkeen and Bhujia by Bikano.